Hydrogen is the most plentiful and lightest element on Earth and in the Universe. Scientists are trying to develop hydrogen as a carbon-free, clean, limitless fuel source for cars as well as other applications, such as telecommunication towers and portable generators, with water being the only combustion byproduct. Although scientific challenges exist to make hydrogen-based fuel sources competitive with the existing automotive propulsion systems and with other technologies, scientists at the U.S. Department of Energy’s (DOE) Lawrence Berkeley National Laboratory (Berkeley Lab) have succeeded in creating a materials recipe for a hydrogen fuel cell, which acts like a battery, to promote its use in some key areas. The hydrogen fuel cell has atomically thin graphene sheets, which engulf hydrogen-absorbing magnesium nanocrystals. 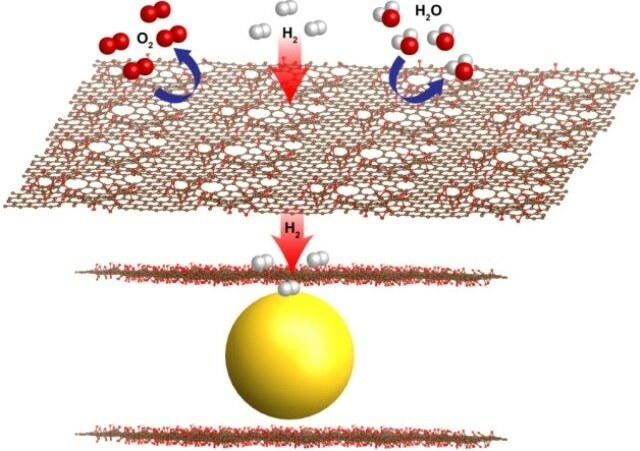 The graphene covers the nanocrystals from moisture, oxygen and contaminants, while minute, natural holes permit the passing through of smaller hydrogen molecules. This filtering phenomenon resolves common problems that lower metal hydrides performance for hydrogen storage. The graphene-engulfed magnesium crystals behave like “sponges” for hydrogen, and offer a safe and compact way to store and absorb hydrogen. The nanocrystals also allow faster fueling, so that the overall “tank” size can be reduced. Among metal hydride-based materials for hydrogen storage for fuel-cell vehicle applications, our materials have good performance in terms of capacity, reversibility, kinetics and stability. In an automobile powered with hydrogen cells using the “metal hydride” (hydrogen bound to a metal) fuel cell, hydrogen gas is absorbed by the magnesium nanocrystaline powder after being pumped into the vehicle, and is made safe at low pressures. This work suggests the possibility of practical hydrogen storage and use in the future. I believe that these materials represent a generally applicable approach to stabilizing reactive materials while still harnessing their unique activity—concepts that could have wide-ranging applications for batteries, catalysis, and energetic materials. The research, carried out at Berkeley Lab’s Molecular Foundry and Advanced Light Source, is part of a National Lab Consortium, termed Hydrogen Materials—Advanced Research Consortium, (referred to as HyMARC). HyMARC is working to produce safer and more cost-effective storage of hydrogen, and Urban is Berkeley Lab’s lead scientist for that research effort. The market share in the U.S. for electrically driven vehicles in 2015, inclusive of full-electric, hybrid-electric, and plug-in hybrid vehicles, was 2.87%. This amounts to approximately 500,000 electrically driven vehicles of a total of around 17.4 million, as per the statistics of the Electric Drive Transportation Association, a trade body promoting electrically driven vehicles. Hydrogen-fuel-cell vehicles have not yet registered high sales, although major auto manufacturers such as Honda, Toyota and General Motors, have invested resources to develop hydrogen fuel-cell vehicles. Toyota’s Mirai, a small-production model using compressed-hydrogen tanks, was released last year in the U.S.
A benefit of hydrogen-fuel-cell vehicles, in addition to their lower environmental impact when compared with the standard-fuel vehicles, is hydrogen’s high specific energy. Hydrogen fuel cells should weigh less than other fuel sources and battery systems, while producing higher electrical energy. The “gravimetric energy density” is the energy storage capacity per weight of hydrogen fuel cells. For hydrogen fuel cells, this parameter is roughly three times more than that of gasoline. According to Urban, this key property when used effectively could stretch the range of hydrogen-based transport vehicles, and increase the time period between refueling for other applications also. More research and development is required to realize the increased capacity of hydrogen storage for long-range vehicles, to exceed the performance of the current electric-vehicle batteries, Cho said. However other applications could be more suitable for hydrogen fuel cells such as; forklifts, stationary power sources, portable power sources (including laptop battery chargers), airport vehicles, water and sewage pumps, portable lighting, and emergency services equipment. Cho said that the hurdle to metal hydride storage is the relatively slow absorption and desorption rates of hydrogen occurring in the cycling of the units. In fuel cells different chemical reactions involving oxygen and hydrogen produce electron flow, which are directed as electric current, with water as a byproduct. According to Cho, the small size of the graphene-engulfed nanocrystals made at Berkeley Lab measuring about 3 - 4 nm, or billionths of a meter across, is vital for the new materials’ quick absorption and desorption of hydrogen, as they have a larger available surface area for reactions, compared to the same material at larger sizes. Another advantage is the protection of magnesium from being exposed to air, which would make the element unusable for the fuel cell. Conducting research at The Molecular Foundry, the scientists developed a simple, cost-effective and scalable “one pan” technique for mixing up the magnesium oxide nanocrystals and graphene sheets in the same batch. The structure of the coated nanocrystals was also analyzed using X-rays at Berkeley Lab’s Advanced Light Source. The analysis showed the reaction of the hydrogen gas, after being pumped into the fuel cell mixture, with the magnesium nanocrystals to form the stable magnesium hydride while preventing oxygen from contacting magnesium. It is stable in air, which is important. Future research can focus on utilizing various types of catalysts, which can enhance the speed and the efficiency of chemical reactions, to improve the fuel cell’s conversion of electrical current further, and to study the potential role of different kinds of material in upgrading the overall capacity of the fuel cell, explained Cho. The work received support from the DOE Office of Basic Energy Sciences and Office of Energy Efficiency and Renewable Energy, the Bay Area Photovoltaic Consortium (BAPVC), and the US-India Partnership to Advance Clean Energy-Research (PACE-R) for the Solar Energy Research Institute for India and the U.S. (SERIIUS).